Breaking Bad showed us early and often the power of transforming a sidekick into a three-dimensional character. First Jesse, of course, who grew from a bit player who was supposed to be killed off in season one, into the moral axis of the show. 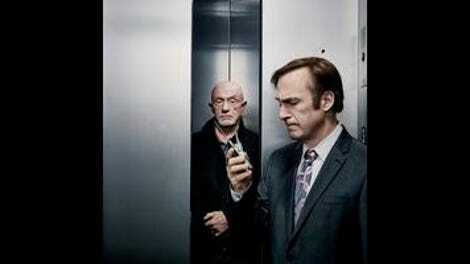 But also Mike, and Gus, and through this spinoff that you’re watching now, Saul Goodman. Now the spotlight shines on Kim Wexler. She gets the first truly devastating moment of BCS season two, standing all by herself under the same soul-crushing anvils that the show dropped on Jimmy McGill’s head in season one. And never again will she be just a gold ring for Jimmy to grasp at, a symbol of what might have been. She draws breath, she vibrates with hope and determination, and if you watch that scene at the front door of HHM with Howard in slow motion, you can pinpoint the exact moment her heart breaks. The key to this transformation is the time that the creators take with it. That long montage of her working her network to bring in new business, Post-Its with possibilities lined up on the window in the stairwell (since she has no office anymore), is a parallel to the montage of Jimmy’s public-defender work that Michelle MacLaren put together in the second episode of the series, “Mijo.” When I reviewed that episode, I admit, I didn’t get it; I criticized the montage as lengthy and repetitive. But now, seeing Kim’s version (set to the Gipsy Kings’ version of “My Way”), I understand completely. Bringing a supporter player to center stage, you’ve got to take your time. For Gilligan and Gould, the way you put a beating, breakable heart into a character is to show her at work. Not just a token glimpse, but over and over, so we feel in our viscera how long it takes, how nobody else notices, how her world shrinks to the boxes of documents she highlights far into the night and the stolen moments where she tries to build a ladder out of that dungeon. Kim, even more than Chuck, is the BCS representative for Doing Things the Right Way. Chuck talks about it a lot, yes, and in the flashbacks we’ve seen he certainly believes that his rise to the top of his profession was fueled by rigid adherence to principle, but Kim is the one we see actually doing it. She worked her way up from “the cornfield” of doc review once before, and she doggedly sets herself to do it again. She’s determined not to beg, not to whine about just deserts, just—one more time—to prove her worth. Somehow Kim has hurt Howard. Maybe it’s that her taking up with Jimmy feels, to Howard, like a betrayal of his mentorship. As he sees it, she chose Jimmy over the firm, and that seems to have cut him deeply. Here’s where the cold open, where we meet Rebecca Bois (the composer of the music Chuck was playing in last week’s cold open) and learn that she and Chuck are a couple, adds another dimension to Kim’s struggle. Chuck warns Rebecca that Jimmy, who’s coming over for dinner, is an uncultured boor, and can barely keep his eyes from rolling as Jimmy swills Old Style from the bottle and tells lawyer jokes. And then Rebecca joins in with a joke of her own, and Chuck can’t believe it. How can she be falling for Jimmy’s transparently desperate, low-class efforts at charm? Worst of all, when he tries to make the same connection with his own joke at bedtime, she’s off his wavelength entirely. Jimmy, awful as he is, has somehow won again. That’s the background for Chuck’s attempt to move in as Kim’s new mentor. He visits her in the cornfield, late at night, and tells her a story about how Jimmy abused their father’s efforts to give them a leg up in the family business, skimming from the till to the tune of $14,000. It’s clear he blames his dad’s death a few months after the theft was discovered on Jimmy’s self-serving actions. Their father, “the personification of good,” couldn’t believe his son had done it; Jimmy, who cried harder at the funeral than anybody, never understood the destruction he caused. “He has a good heart,” Chuck admits, “but he can’t help himself, and everyone else is left picking up the pieces.” To Chuck, he and Kim and Howard are now the same: victims of Jimmy’s charm, left holding the bag when he reverts, inevitably, to type. And maybe he’s the one to “pour oil on troubled waters” and get her job back when Jimmy (of course) couldn’t do it. But Chuck has his own type to revert to: the moralistic busybody, convinced that he knows who doesn’t deserve a second chance. He affects concern over a problematic member of Rebecca’s ensemble, suggesting that she be disinvited for “compromising the work.” Rebecca sees it differently, hoping that a way can be found for the member to stop affecting the group’s morale, but Chuck presses the matter: “Morale can affect quality.” It’s a somehow even more annoying (because it’s masked as a concern for people) than the rigor of Erin, the second-year associate that Clifford assigns to monitor Jimmy and mentor him in the Davis & Main way. She’s appalled that Jimmy tries to bribe the clerk at the courthouse with a Beanie Baby; he can’t believe she’s unwilling to take even the most harmless step to the side of the straight and narrow to get something done for their client. Everybody’s talking past each other in “Rebecca.” If they pause to listen—like Kim, like Mike—they’ll know exactly where they stand. And it has very little to do with how hard they worked to get there. Mike used his $25K to get Kaylee and her mom to a new place, with a pool! But he doesn’t want his granddaughter to see him all beat up, a circumstance he blames on a car accident, and Jimmy dismisses with ‘“first rule of Fight Club” when he zooms past the lot attendant booth on his way into the courtroom. Even worse as the last scene makes clear, his half measures have tied his future to Hector Salamanca, who expects him to get the gun charge dropped against Tuco. Mike has avoided killing, but left himself no clear exit strategy from some messy, demanding obligations. Looks like Hector will be a part of Mike’s life, like it or not, for a long time. Ugh, Chuck mansplaining to Rebecca about Carol Burnett’s tug on the ear. “We put two spaces after a period on all our documents. It looks a lot cleaner on the page.” Confirmed: Davis & Main is an evil place full of evil people.